اسلامی فارسانی, رضا, شهرابی-فراهانی, علیرضا, خسروی, حامد, زمانی, محمدرضا. (1396). بررسی رفتار خمشی کامپوزیت های مشبک تقویت شده با نانو لوله های کربنی چند جداره. علوم و فناوری کامپوزیت, 4(1), 101-108. رضا اسلامی فارسانی; علیرضا شهرابی-فراهانی; حامد خسروی; محمدرضا زمانی. "بررسی رفتار خمشی کامپوزیت های مشبک تقویت شده با نانو لوله های کربنی چند جداره". علوم و فناوری کامپوزیت, 4, 1, 1396, 101-108. اسلامی فارسانی, رضا, شهرابی-فراهانی, علیرضا, خسروی, حامد, زمانی, محمدرضا. (1396). 'بررسی رفتار خمشی کامپوزیت های مشبک تقویت شده با نانو لوله های کربنی چند جداره', علوم و فناوری کامپوزیت, 4(1), pp. 101-108. اسلامی فارسانی, رضا, شهرابی-فراهانی, علیرضا, خسروی, حامد, زمانی, محمدرضا. بررسی رفتار خمشی کامپوزیت های مشبک تقویت شده با نانو لوله های کربنی چند جداره. علوم و فناوری کامپوزیت, 1396; 4(1): 101-108. سازه‌های مشبک کامپوزیتی با توجه به دارابودن ساختار منحصر به فردی که به صورت یک ساختار شبکه­ای متشکل از ریب­ها است، دارای خواصی نظیر نسبت استحکام به وزن بالا، نسبت سفتی به وزن بالا، قابلیت جذب انرژی بسیار بالا و همچنین مقاومت به خوردگی مناسب هستند. در این مقاله، تاثیر افزودن نانولوله‌های‌کربنی چندجداره در درصدهای وزنی مختلف (0، 1/0، 25/0 و 4/0) بر رفتار خمشی کامپوزیت‌های مشبک زمینه پلیمری به صورت تجربی مورد مطالعه قرار گرفت. برای ساخت نمونه‌های کامپوزیتی مشبک حاوی نانولوله‌های‌کربنی چندجداره از روش لایه­گذاری دستی استفاده شد که در آن پوسته از رزین اپوکسی تقویت شده با الیاف شیشه و ریب‌ها با هندسه آنیزوگرید از رزین اپوکسی تقویت شده با الیاف کربن ساخته شدند. سپس بر روی این نمونه‌ها آزمون خمش سه‌­نقطه‌ای صورت پذیرفت و پارامترهایی نظیر حداکثر بار خمشی، سفتی خمشی و میزان جذب انرژی مورد بررسی قرار گرفتند. نتایج تجربی نشان داد، بهترین رفتار خمشی به ازای افزودن 4/0 درصد وزنی نانولوله‌های‌ کربنی حاصل می‌شود که در این حالت، میزان حداکثر بار خمشی، سفتی خمشی و میزان جذب انرژی صفحات مشبک کامپوزیتی به ترتیب به میزان 24، 35 و 25 درصد نسبت به نمونه مشبک فاقد نانولوله‌های‌ کربنی، افزایش می‌یابد. همچنین نتایج مطالعات ریزساختاری با استفاده از میکروسکوپ الکترونی بهبود خواص فصل­مشترکی بین الیاف تقویت­کننده و زمینه را در ارتباط با نمونه نانوکامپوزیتی نشان دادند که نقش بسزایی را در بهبود خواص مکانیکی سازه مشبک ایفا می­کند. Grid composite structures (GCSs) owing to their unique shape which is a network of ribs, have some interesting properties such as low strength to weight ratio, low stiffness to weight ratio, high energy absorption capability and good corrosion resistance. In this study, the effect of the multi-walled carbon nanotubes (MWCNTs) addition at various weight percentages with respect to the matrix (0, 0.1, 0.25 and 0.4) on the flexural behavior of GCSs was experimentally examined. For fabricating of the composites, hand lay-up method was used, where plain E-glass and unidirectional carbon fibers impregnated to the resin mixture were used in the skin and rib parts. Afterwards, 3-point bending test was performed on these specimens and the parameters such as maximum flexural load, flexural stiffness and energy absorption were studied. Experimental results showed that, the best flexural behavior was obtained with the addition of 0.4 wt. % of MWCNTs. In this case, the maximum flexural load, flexural stiffness and energy absorption of the GCSs increased by 24%, 35% and 25%, respectively compared to the specimen without MWCNTs addition. The microstructural investigations of the fracture surfaces using electron microscopy clearly indicated the improvement in the interfacial adhesion between the fibers and epoxy matrix in the case of the nanocomposite specimen. This case plays an important role for improvement in the mechanical properties of the GCSs. Lim, K. He, W. Guan, Z., “Buckling Analysis of Advanced Grid Stiffened Composite Cylinders”, Advanced Materials Research, Vol. 875-877, pp. 755-762, 2014. Morozov, E. V. Lopatin, A.V. and Nesterov, V,A., “Finite Element Modeling and Buckling Analysis of Anisogrid Composite Lattice Cylindrical Shells”, Composite Structures, Vol. 93, pp. 308–323, 2011. Vasiliev, V.V. Barynin, V.A. and Razin, A.F., “Anisogrid Composite Lattice Structures, Development and Aerospace Applications,” Composite Structures, Vol. 94, pp. 1117–1127, 2012. Huybrechts, S.M. Meink, T.E. Wegner, P.M. Ganley, J.M., “Manufacturing Theory for Advanced Grid Stiffened Structures”, Composites Part A, Vol.33, pp. 155-161, 2002. Vasiliev, V.V. and Razin A.F., “Anisogrid Composite Lattice Structures For Spacecraft And Aircraft Applications”, Composite Structures, Vol. 76, pp. 182–189, 2006. Totaro, G., “Local Buckling Modelling Of Isogrid And Anisogrid Lattice Cylindrical Shells With Hexagonal Cells”, Composite Structures, Vol. 95, pp. 403–410, 2013. Jingxuan, H. Mingfa, R. Shiyong, S. Huang, Q. Sun, X., “Failure Prediction on Advanced Grid Stiffened Composite Cylinder Under Axial Compression”, Composite Structures, Vol. 93, pp. 1939–1946, 2011. Shokrieh, M.M. Saeedi, A. and Chitsazzadeh, M., “Evaluating The Effects of Multi-Walled Carbon Nanotubes on the Mechanical Properties of Chopped Strand Mat/Polyester Composites”, Materials Design, Vol. 56, pp. 274-279, 2014. Khan, S.H. and Kim, J., “Impact and Delamination Failure of Multiscale Carbon Nanotube- Fiber Reinforced Polymer Composites: A Review”, International Journal of Aeronautical and Space Science, Vol. 12, pp. 115–133, 2011. Zhang, J. Su, J. Jiang, D. and Peng, H., “Reducing Dispersity Of Mechanical Properties Of Carbon ﬁber/Epoxy Composites By Introducing Multi-Walled Carbon Nanotubes”, Composites, Vol. 54, pp. 371–376, 2013. Zhou, Y. Pervin, F. Rangari, V. K. and Jeelani, S., “Fabrication and Evaluation of Carbon Nanoﬁber ﬁlled Carbon/Epoxy Composite”, Materials Science and Engineering, Vol. 426, pp. 221–228, 2006. Zainuddin, S. Fahim, A. Ariﬁn, T. Hosur, M. V. Rahman, M. M. Tyson, J. D. and Jeelani, S., “Optimization of Mechanical and Thermo-Mechanical Properties of Epoxy and E-Glass/Epoxy Composites Using NH2-MWCNTs, Acetone Solvent And Combined Dispersion Methods”, Composite Structures, Vol. 110, pp. 39–50, 2014. Lee, J. H. Rhee, K. Y. and Park, S. J., “The Tensile and Thermal Properties of Modified CNT-Reinforced Basalt/Epoxy Composites”, Materials Science and Engineering, Vol. 527, pp. 6838- 6843, 2010. Kim, M.T. Rhee, K.Y. Park, S.J., and Hui, D., “Effects of Silane-Modified Carbon Nanotubes on Flexural and Fracture Behaviors of Carbon Nanotube-Modified Epoxy/Basalt Composites”, Composites (Part B), Vol. 43, pp. 2298–2302, 2012. Rahman, M.M. Zainuddin, S. Hosur, M.V. Malone, J.E. Salam, M.B.A. Kumar, A. and Jeelani, S., “Improvements In Mechanical And Thermo-Mechanical Properties Of E-Glass/Epoxy Composites Using Amino Functionalized MWCNTs”, Composite Structures, Vol. 94, pp. 2397-2406, 2012. 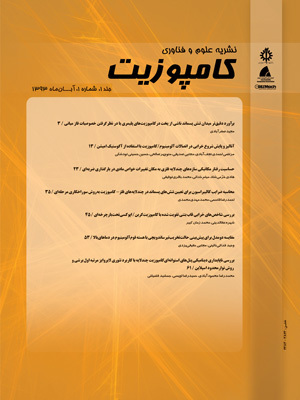 Shokrieh, M. M. Zeinedini, A. and Ghoreishi, S. M., “Effects Of Adding Multi Wall Carbon Nanotubes On Mechanical Properties Of Epoxy Resin And Glass/Epoxy Laminated Composites”, In Persian, Modares Mechanical Engineering, Vol. 15, pp. 125- 133, 2015. Khosravi, H. and Eslami Farsani, R., “On the Mechanical Characterizations of Unidirectional Basalt Fiber/Epoxy Laminated Composites with 3-Glycidoxypropyltrimethoxysilane Functionalized Multi-Walled Carbon Nanotubes–Enhanced Matrix”, Journal of Reinforced Plastics and Composites, Vol. 35, pp. 421-434, 2016. Sinar, A. A. Nurazni, M. A. Firuz, Z. Hazizan, M .A. SitiShuhadah, M. S. and Sahrim, H. A., “Treatment Method For Dispersion Of Carbon Nanotubes A Review”, Materials Science Forum, Vol. 803, pp. 299-304, 2015. Huang, Y.Y. and Terentjev, M.E., “Dispersion of Carbon Nanotubes: Mixing, Sonication, Stabilization, and Composite Properties”, Polymers, Vol. 4, pp. 275-295, 2012. Peng, M. Siddiqui, N. Marom, G. and Kim, J.K., “Dispersion and Functionalization of Carbon Nanotubes for Polymer-Based Nanocomposites: a Review” Composites, Part A, Vol. 41, pp. 1345–1367, 2010. Xie, L.X. Mai, W.Y. and Zhou, P.X., “Dispersion and Alignment of Carbon Nanotubes in Polymer Matrix: A Review”, Materials Science and Engineering, Vol. 49, pp. 89-112, 2005. Khosravi, H. Eslami-Farsani, R., “Reinforcing Effect of Surface-Modified Multiwalled Carbon Nanotubes on Flexural Response of E-Glass/ Epoxy Isogrid-Stiffened Composite Panels”, Polymer Composites, 2016. First Online Published, DOI 10.1002/pc.24118. Standard Test Method for Flexural Properties of Polymer Matrix Composite Materials. Annual Book of ASTM Standard, D7264/D7264M–07, 2007. Kim, J.K. and Mai, Y.W., “Engineered Interfaces in Fiber Reinforced Composites”, Elsevier, pp. 93- 94, 1998. Kocsis, J.K. Mahmood, H. Pegoretti, A., “Recent Advances In Fiber/Matrix Interphase Engineering For Polymer Composites”, Progress in Materials Science, Vol. 73, pp. 1-43, 2015. Irshidat, R. M. Al-Saleh, M.H. and Al-Shoubaki, M., “Using Carbon Nanotubes To Improve Strengthening Efficiency Of Carbon Fiber/Epoxy Composites Confined RC Columns”, Composite Structures, Vol. 134, pp. 523–532, 2015. Mehan, M. L. and Schadler, L. S., “Micromechanical behavior of short-Fiber polymer composites”, Composites Science and Technology, Vol. 60, pp. 1013-1026, 2000. Houshyar, S. Shanks, A. and Hodzic, A., “Modelling Of Polypropylene Fiber-Matrix Composites Using Finite Element Analysis”, Express Polymer Letters, Vol. 3, pp. 2-12, 2009. Tehrani, M. Boroujeni, A. Y. Hartman, T. B. Haugh, T. P. Case, S. W. and Al- Haik, M.S., “Mechanical Characterization and Impact Damage Assessment of a Woven Carbon ﬁber Reinforced Carbon Nanotube-Epoxy Composite”, Composites Science and Technology, Vol. 75, pp. 42-48, 2013. Garcia, J. E. Wardle, B. L. Hart, A. J., “Joining Prepreg Composite Interfaces With Aligned Carbon Nanotubes”, Composites part A, Vol. 39, pp. 1065-1070, 2008. Seshadri, M. Saigal, S. and ASCE, F., “Crack Bridging in Polymer Nanocomposites”, Journal of Engineering Mechanics, Vol. 133, pp. 911-918, 2007.